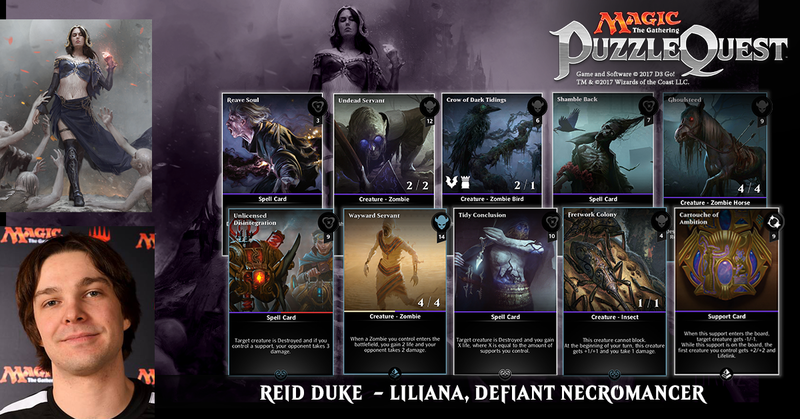 Today we introduce Team Puzzle Quest member Reid Duke. These members are sponsored Magic: The Gathering – Puzzle Quest players at Pro Tour events in 2017. Please follow them on Twitter and watch them compete at events via Twitch. Team Puzzle Quest is currently ranked #5 in the Pro Team Series Leaderboard. Top Pro Tour Results: Runner-up 2013 World Championship, Top 8 finishes at PT Journey into Nyx in Atlanta, and PT Eldritch Moon in Sydney. Winner at GP Nashville 2012, GP Miami 2013, GP Portland 2014, GP Oakland 2016, and GP Louisville 2017. Your Go-To Card in Magic: Puzzle Quest for this Planeswalker: Wayward Servent, Undead Servant, Ghoulsteed, Crow of Dark Tidings, Fretwork Colony, Shamble Back, Cartouche of Ambition, Reave Soul, Tidy Conclusion, Unlicensed Disintegration. Amonkhet’s Wayward Servant has given me a great reason to choose zombies as my win conditions. However, Liliana’s strength isn’t in her creatures, but in her ability to kill opposing creatures. Combining her Grave Mist ability (which at high levels deals five damage to all of the opponent’s creatures) with no-questions-asked removal like Tidy Conclusion and Unlicensed Disintegration makes it nearly impossible for the opponent to stick a creature on the battlefield.